El Cóndor Pasa (pronounced: [el ˈkondoɾ ˈpasa], Spanish for “The Condor Passes”) is a song from the zarzuela El Cóndor Pasa by the Peruvian composer Daniel Alomía Robles, written in 1913 and based on traditional Andean folk tunes. It is possibly the best-known Peruvian song worldwide due to a cover version by Simon & Garfunkel in 1970 on their Bridge over Troubled Water album. This cover version is called “El Condor Pasa (If I Could)”. Paul Simon heard a version called “Paso Del Condor” by Jorge Milchberg, who was head of the group Urubamba (then known as Los Incas), who told Simon that the song was an 18th-century musical composition by an anonymous composer. Simon became interested in the song and composed new lyrics for the melody. The song appeared on Simon and Garfunkel’s 1970 album Bridge over Troubled Water and they used without permission the instrumental version of Los Incas as the basic-track. Simon became friendly with the group through this song and ended up touring with them and producing their first American album. I’ve always been intrigued by the haunting melody of this piece and it was a regular part of my repertoire when I was in college and performing in local and regional coffee houses and hootenannys. My roommate, Tom Buser, and I regularly performed on college staged hootenannys which were a popular mainstay of the folk music revival of the 60’s and 70’s. I distinctly remember us performing at a local university hootenanny on a stage “in the round”. A few weeks later the late John Denver performed on that same stage. It was a very exciting and formative time for me as a musician. 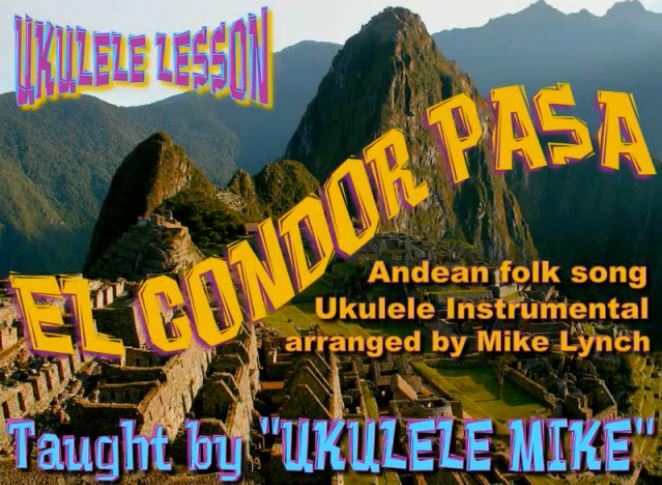 One day while I was randomly strumming chords on my ukulele I began to form the progression for El Condor Pasa. In no time I was pleased to discover that the main melody line fit quite nicely on the first string entirely. So I came up with this arrangement that alternates between single note melody on the first string with chordal responses. Typically the flat pick is not used in ukulele playing but I just found it worked really well with this song to add a distinctively strong feeling to the single melody line. Below are several small examples of the tablature notation for my arrangement of El Condor Pasa. Notice that the standard treble clef notation is on the upper stave. My thanks to great ukulele performer and songwriter Narciso Lobo (Seeso) for kindly doing the transcription of my arrangement. Music for this arrangement of El Condor Pasa is available in both tablature and standard treble clef notation and is included in my Chord/Melody eBook ONE. It can be purchased by making a payment of $29.95 through the paypal button on my website: http://www.ukulelemikelynch.com Once purchased, it will be emailed to you within the day.